Pierce Brosnan plays a retired CIA hitman/operative called out of retirement to bring in an old asset who only trusts him. It seems she needs to get out of Moscow because she has discovered the name of an asset that can topple the Russian government. Brosnan gets the girl but a sniper kills her right after he picks her up. 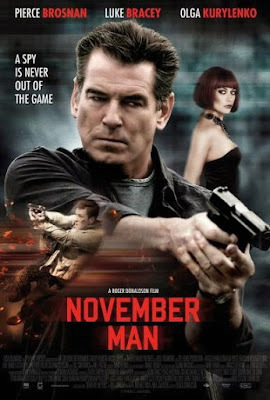 This sets Brosnan on a mad dash to find the asset and get revenge- since unknown to anyone the dead girl was his wife and the mother of his child and Brosnan wants someone to pay. With lots of action, a few twists and some good performances November Man is a solid little thriller. The sort of film they don’t make often in the US unless it’s a Bourne film it’s nice to see a film that bounces around Europe where someone other than a young hunky guy is in the lead. This is the sort of film that nicely shows off what the Bond films might have been had they not been concerned less about fantastic action and more about characters. While not perfect, there is a point in the last half hour when you suddenly realize that the film has a few too many plot threads and red herrings floating around, this still is a compelling action film. Watching the film on cable a few weeks back I was getting ready to go to bed and found myself sitting on the edge of my bed for two hours.